Over the years, Achilles has developed specialized programs for children, teens, adults and veterans. Achilles provides training, racing opportunities, and social events for athletes with disabilities. We also bring running and marathon opportunities to veterans who suffered trauma while serving in a branch of the Canadian Armed Forces, predominantly those who served in Iraq and Afghanistan. 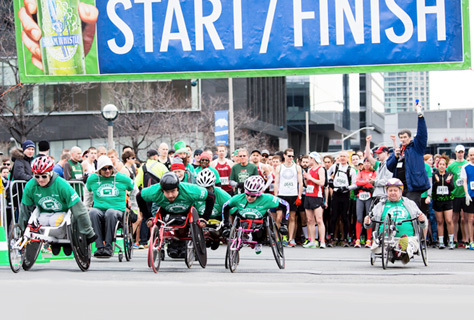 Nothing illustrates this more than our signature fundraising event, the St. Patrick’s Day 5K Run in Toronto, Canada. In our race able-bodied runners and athletes with disabilities participate side-by-side and, with several disability award categories, it puts a first place win within the grasp of all runners.